During the holidays I built a 4 inch wide shelf that runs the length of one wall in my painting studio — and I love it! It looks good and it just works! I tend to work in batches — that is to say, I have several paintings going – at various stages of development – at any given time. 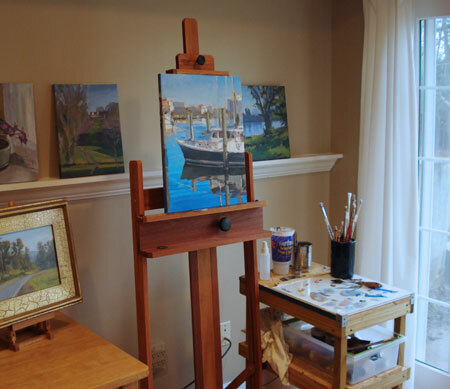 The shelf allows me to conveniently display the works-in-progress, and then exchange the painting on my easel to work on for a while. Here you can see my studio with several unfinished canvases on the new shelf. What systems do you use to streamline your studio and help keep yourself productive? What a great idea. Thank you. Also thank you for all the great “artist” tips you share. i built a shelf like yours, out of preprimed molding from home depot, and screwed about 100 tiny hooks on the bottom edge, hanging straight down, and then used fishing line to hang stuff from the hooks. I hung my shelf just above eye level so more room to hang stuff below. i have my first show, at a coffee shop, in april. nervous.